Trader Joe’s annual Pumpkin Madness in October is always my favorite time of the year, if just for the sheer thrill of seeing which products Joe decides to green light – but I also love it because once those gates are thrown open they stay open for the rest of the year. With the pumpkin products receding into the distance behind us, we now find ourselves fording the wild rapids of Holiday product season. What it is: Gyoza filled with seafood paste. Worth it: No. There are tastier potstickers out there. We don’t usually see anything quite as crazy as we do in October over the holidays, but Trader Joe’s still manages to slip one or two out there products in when no one is looking – like chocolate milk mixed with wine. What surprised me most, as I was perusing the aisles, was this extremely unusual holiday (???) 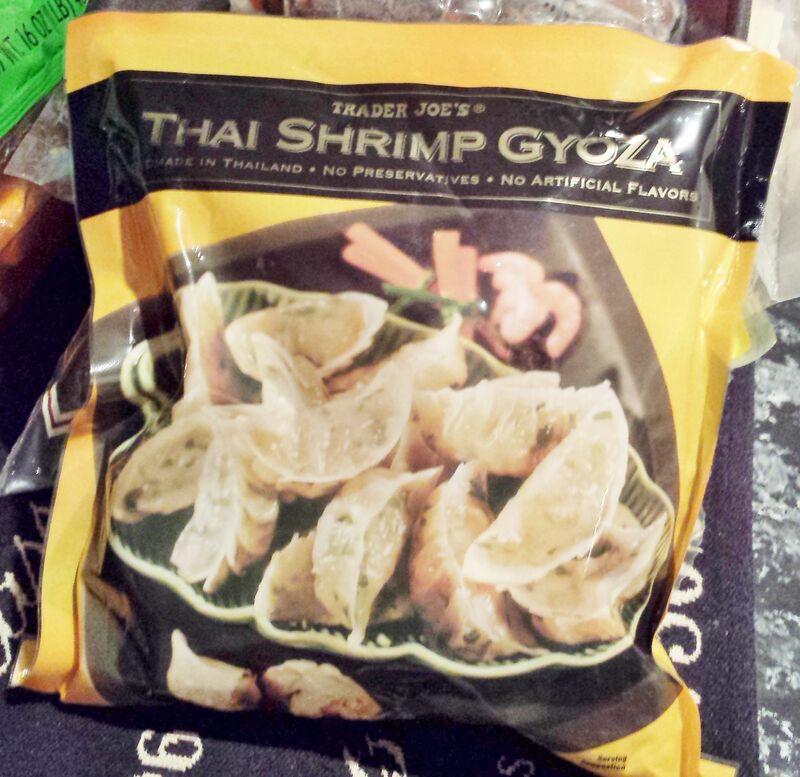 offering – Trader Joe’ Seafood Sriracha Potstickers with Shrimp and Crab. Seafood potstickers don’t generally scream “Christmas”, but hat hasn’t stopped TJ’s from wrapping these dumplings up in red and green dough. Let the festive, merry colors of crimson red and evergreen greet you in this mixed meat, Asian-style, seafood dumpling. It’s a weird choice, sure, but there’s no denying they’ll fit right in at the annual Christmas potluck. The rest of the year, assuming these stay around the rest of the year, I guess they’ll just be weirdly out of place. These potstickers are very similar to Trader Joe’s many other gyoza offerings – namely they are cheap, tasty and easy to cook. Despite the difference in color, each dumpling is filled with same filling – a combination of shrimp, crab, mung bean noodles, and water chestnuts. 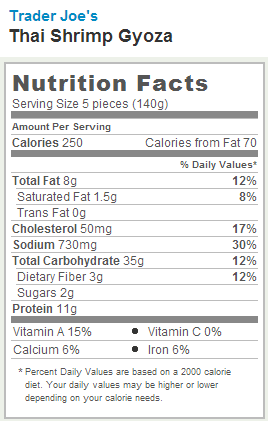 These flavors all blend into each other, however, so don’t go expecting big, tasty pieces of either crab or shrimp. Instead, the ingredients have been blended into a uniform paste that has been pumped into each casing. This makes these gyoza much less substantial than their pork and chicken brothern, and gives them a consistency much closer to a classic, mashed potato filled potsticker. Presumably, that’s why they left “gyoza” off the label and went with “potsticker” – although it makes the choice to call the whole-wheat and squash version “gyoza” even more bizarre. In any case, if you don’t mind the soft texture, and weird coloration, these potstickers are reasonably tasty and a welcome return to form over the dreaded wholewheat version debuted last month. The inclusion of some sriracha spice in the filling is a nice touch, although TJ’s is careful to keep the heat in the mild range band. If you want to spice these up, you’ll want to bring some TJ’s Sriracha hot sauce or cilantro Green Dragon hot sauce – or even a nice chili sauce of your own. Personally, I thought these were fine, but nothing to write home about. The seafood doesn’t really standout in the prepared product, and without that it’s just a sort of mildly, inoffensive dumping. Trader Joe’s has a LOT of gyoza varieties to choose among nowadays, from the mundane to the adventerous. Once you get past the eye-catching colors, there isn’t anything to set these potstickers ahead of the pack. Would I Recommend Them: Not really. They’re fine, but there are better gyoza on the shelf. Would I Buy Them Again: No, I prefer the chicken and pork versions. Final Synopsis: A good appetizer for a holiday-themed party, but not much more.